Front row (left to right): 1. Randy Cofer, 2. unidentified, 3. unidentified, 4. Philip Eckert, 5. Kenny Abbott, 6. unidentified, 7. Doug Mendenhall, 8. Thomas Iddings. Second row: 1. unidentified, 2. Terri Hallock, 3. unidentified, 4. unidentified, 5. Susan Rasmussen, 6. Eleanor Bonner, 7. Connie Obregon, 8. Vickie Cain, 9. unidentified. Third row: 1. Mrs. Sands, 2. unidentified, 3. John Frydendal, 4. 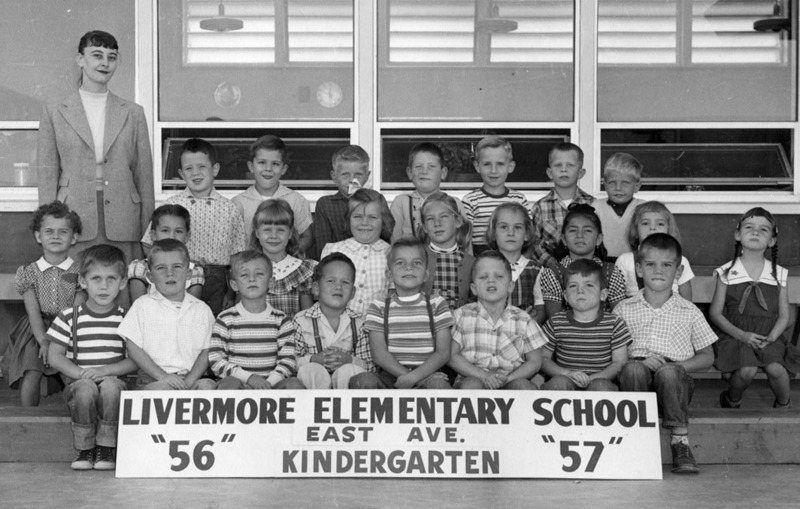 Bill Beyer, 5. unidentified, 6. unidentified, 7. Tom Ellis, 8. unidentified. Mrs. Sands was later replaced by Mrs. Beckman. Phil believes that this class was the first kindegarten class to use the newly built kindegarten room at East Avenue School. The class started the school year in what later became the library because the kindegarten room was not quite completed. The kindegarten room was the room at the far right of the school when you are facing it from East Avenue.